It's such a shame that our nearby Barnes & Noble store recently shut down because that's where we normally snagged all of the print magazines when we happened to be fortunate enough to be featured! 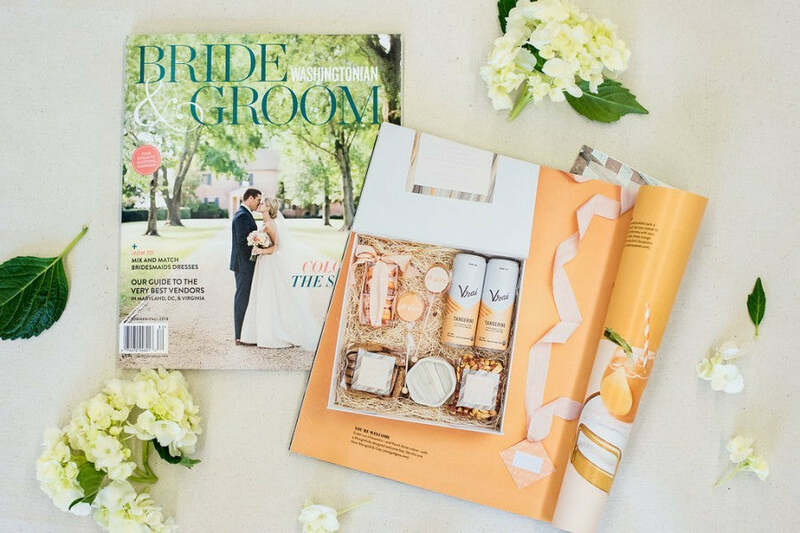 It's not a great excuse but it does help explain why we are so late sharing the news that we have a full page feature in the most recent issue of Washingtonian Bride & Groom magazine! We were tasked with coming up with an orange themed gift box which shocked me, to be honest, because people tend to steer clear or orange. They either love it or hate it, am I right? Considering our brand is inspired by the color marigold (my own wedding colors, btw), we were definitely up for the challenge! 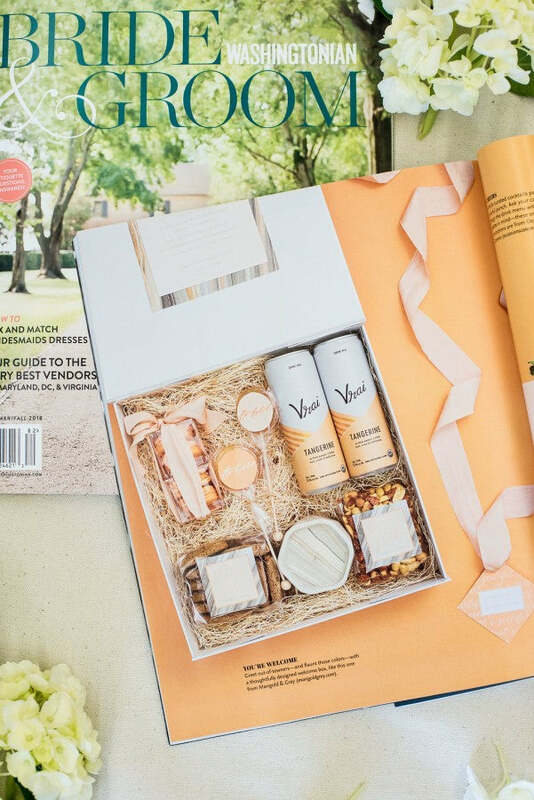 We selected a crisp white foldover-style gift box and filled it with snacks, beverages and a gorgeous keepsake candle. With blush being an accent color, we packaged blood orange macarons in clear treat boxes and finished them off with corresponding ribbon. We found the prettiest honey lollipops along with modern tangerine tea. And now for the custom paper pieces to tie everything together! Claudia Smith of Fig2 Design had simultaneously been asked to do a stationery suite for the same feature and so naturally, we reached out to her to partner on the paper items to go inside the box. I'm so glad she did because her creative genius (and passion for tasteful pops of color) helped everything come together perfectly! The phrase "to have and to hold" were used throughout Fig2's stationery suite design so we pulled this wording into the gift like we so often do with many of our wedding welcome gift designs. One lollipop had "to have" and the second one had "to hold". An "xo" pattern was also used in the stationery suite and we pulled it through to the snack packaging featuring gingersnap cookies and a gourmet nut mix. The welcome letter was affixed to the inside flap of the box and the marble pattern of oranges and greys was also used as the cover to the artisan candle. We finished the gift off with blush ribbon and a corresponding gift tag featuring the "to have and to hold" repeating pattern. It was a true team effort on this one with Fig2 (see her featured stationery suite here!) and we can't thank her enough for helping us create a gift design that was perfectly in-line with the aesthetic of the rest of the feature. And a heartfelt thanks to Washingtonian Bride & Groom for including us in this recent issue. It's a huge, huge honor!